I have decided to begin a blog dedicated to my passion for art, and my hunger to share the directions that my creativity heads in. 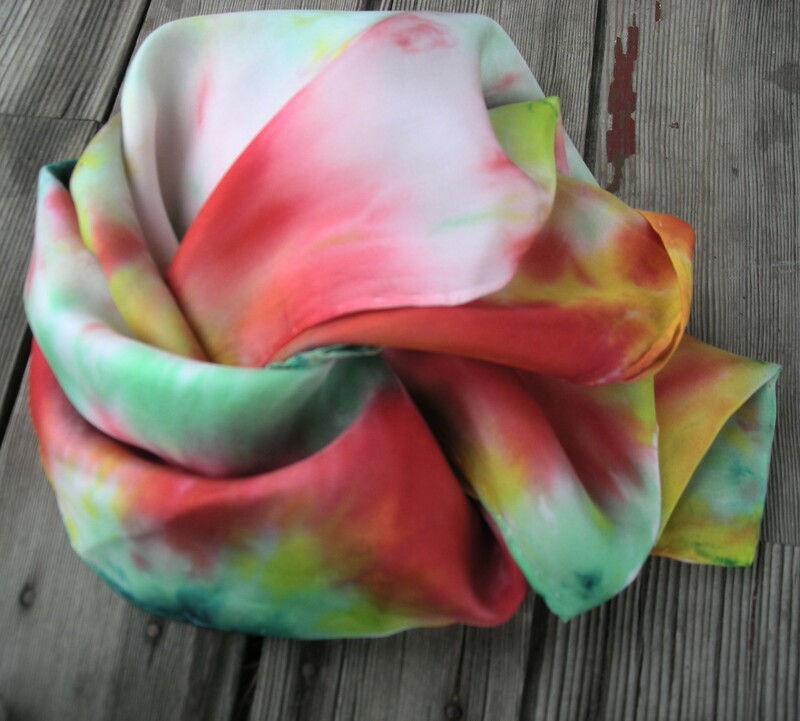 The hand dyed silk method I utilize is known as the shibori style, or japanese technique that involves knotting, folding, and wrapping the fabric before dying. Each scarf is like opening a christmas present because the actual pattern has a small element of suprise. The longest part of the process to hand dye the silk is preparing the silk, tying or sewing the knots into the fabric, and planning where the dye will be placed. I have been striving to dye my silk to resemble images of flowers. Like all forms of art, the more you practice the more interesting this is getting. I plan to post photos of my latest work as I process new pieces. I have discovered a passion in wire crochet. 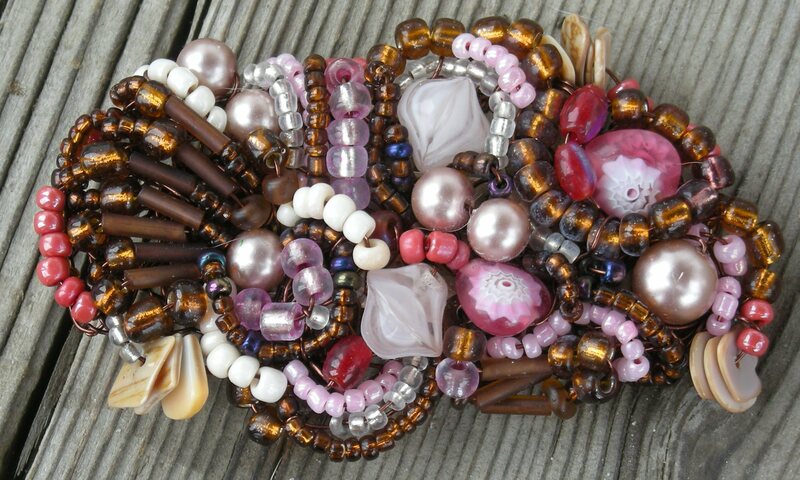 Amazing how quickly wire transforms into a lovely bobble, bracelet, or pin. 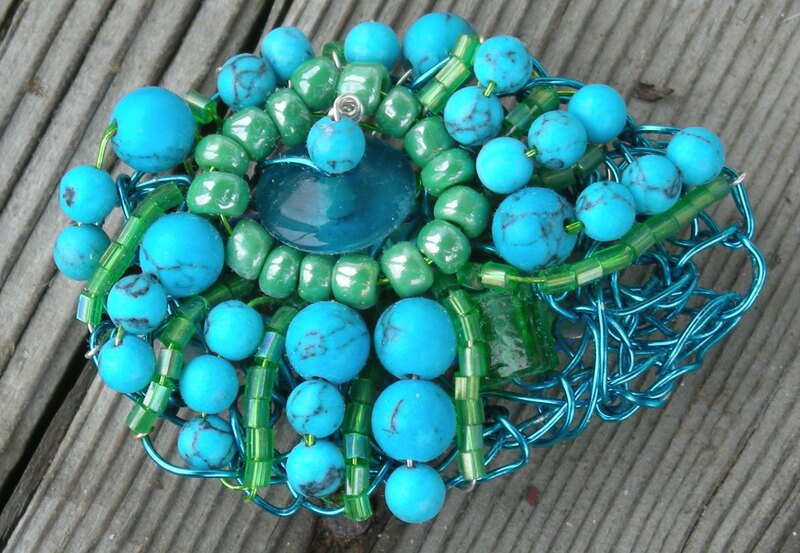 Beads embroidered into the wire crochet take the work to a whole new level. And I have discovered magnetic pin backs and love them!!!! And the Reblooming Bags, made from upcycled plastic grocery bags has been a wonderful joy for me. Utilizing between 100-300 grocery bags per handbag or tote, I think I am making a small dent in saving the landfills from plastic. While i am only 1 woman, I like to think that each handbag created is a statement of environmental awareness. Hope you can stop and visit for Pop Up Pearl. I am in the truly carpet store (now out of business). it is in that strip between broadview and the former deaconess hospital, on the same side of the street. Steve is leading the guys from our church barbequeing across the street, between the former mexcan restaurant (yes, it went out of business) in the green space …. they have a bunch of musicians that will be playing the blues, and southern country, and some gospel… fun bunch…. should be entertaining. Thanks, it remains a learning experience on the photography piece, especially with my not so fabulous nikon, but i took much of your direction to heart, and realized that on gray, overcast days the lighting was just right to make the colors pop if i went out on my weather worn wooden porch floor. I am having fun with everything, and a growing confidence this is what i need to be doing with my life. Bella Dubby was interesting. I met some great people who are trying to find their way in the market with their goods… i like that sense of community. I felt like the oldest woman in the room, because the crowd was younger, but it was good. The rain threatened some, but there were surprisingly a good crowd that came, drank coffe, hung out, and sniffed Steve’s soap. Building the image, and the brand is a process… learning to recognize where my market is and where it is not is one thing that is always challenging… but i am learning. and i am learning to lead with an open mind and not keep trying to put that darn business school analysis on everything.